HAYWARD | Hayward is now in the market for a new police chief, but we still don’t know why. Police Chief Diane Stuart, currently on leave pending an investigation into an unknown matter, is retiring, the city announced Wednesday. Stuart’s retirement is effective immediately, said Hayward City Manager Kelly McAdoo. Stuart was planning to retire in the spring, according to a statement, after 26 years in law enforcement. She had served as Hayward police chief since 2011. 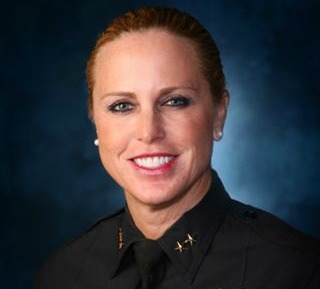 “Chief Stuart’s only interest is to ensure that members of her Department are able to continue serving the Hayward community safely and without the unfortunate distractions of the last few months,” said a joint statement from Stuart and McAdoo. Meanwhile, there is still no information regarding why Stuart, formerly Diane Urban, was placed on paid administrative leave last August. Rumors have been flying over exactly what is being alleged of Stuart and city officials have been uncommonly tight-lipped. The city’s refusal to provide information regarding the matter, in accordance with state public records requests, was recently met with a legal complaint filed earlier this month by KQED. The city said Wednesday that Stuart has not viewed the investigation into her alleged action, but again reiterated the inquiry was triggered by an anonymous letter. Hayward city officials are treating the investigation as a personnel matter, which could shield Stuart by citing employee privacy laws, primarily those involving law enforcement officials. Posted in anonymous letter, Diane Stuart, Hayward, Hayward Police, investigation, Kelly McAdoo, law enforcement, personnel, retirement. Bookmark the permalink. This means retirement in lieu of being fired. How old was she when she started in law enforcement? What was her salary, and also total compensation, during her last few years in law enforcement? Several years ago I read that based on present trends, within a few decades or less a lot of cities and counties would be spending over eighty percent of their total revenues (in other words, the tax money they had to provide services to the community) on pensions, and therefore leaving very little money to provide services to the taxpayers who had paid those taxes. And as to how we have arrived at such an insane situation, in many cities and counties the highest ranking politicians, and such as for instance the city council or the county board of supervisors, have made it a matter of law that their own fringe benefits will always at least match, and in some cases even exceed, those of any and all lower ranking employees, so therefore the big boys have a huge incentive to be extremely generous in the pensions they set for firefighters and members of law enforcement. And it is especially ridiculous the huge amounts we give firefighters as far as salaries and pensions, since a huge percentage of firefighters are such extreme alcoholics, and in fact totally useless, that therefore if they had gotten a minimum wage job at a fast food joint, they would have quickly been fired for showing up at work drunk or general lack of dependability. She must done something worse than being drunk on duty like Fire Chief Contreras. Fran David let him keep his job. Something really bad and very embarrassing for city hall. Maybe that's why Fran decided to finally retire before the real story came out. Barbara Halliday and the City officials, you are really looking bad. The community wants transparency and respect, but your decisions are always in the opposite direction of that. Poor Craig Calhoun had absenteeism, ineptness and his general lack of leadership plastered all over the front page of The Daily Review when he reigned as Chief of the Hayward Police Department. A book was even written about it. Now with Chief Stuart, everything is clandestine and nothing is being disclosed. Seems like city hall is pulling a fast one on its residents again. Shame on you Mayor Halliday! Total cost of employment 2015 $365,952.14. Salary $213,897.84. Other pay $40,196.57. Total benefits $111,857.93.Add Clark Stuart's sweetheart contracts with the city for the last five or so years and you have Hayward's version of “Lifestyles of The Rich and Famous.” And they say Hayward is going broke. In regard to the above post of 8:28AM, certain groups, and such as some of the higher ranking public officials, are receiving such outrageously high salaries, pensions, and other fringe benefits, that if it continues the US will become a third world style country. In other words, and as I learned about a billion or so years ago back when I was in seventh grade or so, there were some backward countries with a lot of extremely poor people, a few extremely wealthy and very privileged people in the upper class, and no middle class. And in various cities and counties the politicians are attempting to make the US like that. And especially if Diane Stewart will be receiving a pension similar to the outrageously high and totally ridiculous ones that retired Bay area firefighters receive, then we common people should no longer refer to ourselves as taxpayers, but instead as serfs, in other words the slaves that support the lords of the manor. There are hundreds of city workers who had the city's budget balanced on their backs all those years. So that's where all the givebacks and takeaways ended up. Retired CEO David and her co-horts claimed their rewards. Another black eye for Hayward. City council awards contracts to whoever city staff recommends. That's what happens when you have 7 gutless follwers as mayor and council. Add a corrupt city manager like Fran David and you get an embarrassing, expensive disaster like this. The Chief of Police was investigated in 2015, while David was still the city manager. Then in 2016, Fran jumps ship before the Chief gets investigated for wrong doings. No wonder the city has trouble attracting employees, unless they are relatives of current city employees. Council was busy fussing about the School Board instead of taking care of city business. Shouldn't they be fiscally responsible when awarding expensive city contracts? Wasteful spending. No wonder they are always raising taxes and crying broke at the same time. There's a lot more to this story, that's why the city is covering things up. The city of Hayward is known for its Sweetheart Contracts. The Stuarts just did what every other contractor does. Take advantage and overcharge for shoddy services. If you're planning on participating in a peaceful demonstration or protest keep one thing in mind, at any time it could turn into a bloody riot. The following will provide you some tips and advice to keep you as safe as possible should you suddenly find yourself in a war-zone.I find this website for Police Boots.If you want you can visit this site.